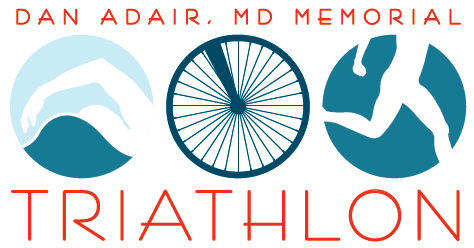 Sunday, August 26th, 2018 is the 3rd annual Dr. Dan Adair MD, Memorial Triathlon. 7:30a.m. The competitive race starts at 8:30 a.m. with a 400 yard swim, a 12 mile bike and finishes with a 5k (3.1 mile) run. All racers will receive a gender specific custom race shirt, finisher medal, race number belt and bib with bike frame sticker. In addition, there will be on-course support, post race food and drinks and an award ceremony. An Award Ceremony is scheduled to begin immediately after the conclusion of the race. Individuals: $45 thru 12:00 am on 8/25/2018; $55 thru race day. Relays: $85 thru 12:00 am on 8/25/2018; $105 thru race day. Individuals: $55 thru 12:00 am on 8/25/2018; $65 thru race day. Relays: $105 thru 12:00 am on 8/25/2018; $125 thru race day. Although residents will be allowed on Iles Avenue, the section of Iles between Lenhart Rd. and Archer Elevator Road to the Sangamon Valley Bike Trail will be closed by the Springfield Police Department. Although the bike courses are on primarily opened roads, the Springfield Police will be monitoring and restricting vehicle traffic at Iles and Archer Elevator Rd. The Sangamon County Sheriff will be controlling traffic at Lenhart Rd. and Iles, Curran Rd and Werner, Farmingdale and Old Jacksonville and Old Jacksonville and New Salem Church Rd. The non competitive racers will follow the Yellow arrows and signs. The competitive racers will follow the Orange arrows and signs. The Bike course proceeds in a clockwise loop and is open to traffic. The run course is mainly closed. It is closed once you are on the trail. You will run inside the coned lane on Iles and you will run on the left. Once you are on the bike path please run on the right to maintain the traffic flow with the non racing public. You will turn around at the Yellow A frame sign for non competitive runners or the Orange A frame sign for competetive runners. When you return to Iles from the bike path please run on the left to Finish. Water and Hammer Nutrition’s HEED will be available at the Start, in Transition, at the Finish and at the hydration stations. The non competiitive runners have no water on the course due to the short distance. The competitive runners have water at mile .9 and 2.2. Restrooms are located in the commons area and transition area. There are no on-course facilities due to the relatively short distances. Medical personnel will be at the Start/Finish and on course. Ambulance and Police departments can be reached at 911. Racers will receive pizza, fruit, cookies and drinks after their race. Please show bib for lunch. All volunteers will receive a lunch but must wear their volunteer shirt to receive. The course will be marked with yellow and orange paint directional arrows on the road and volunteers will be on course. Signs with yellow or orange will show on course turns. Green paint on street means rough spot. Pay attention for the Green paint.